Chile extends some 2,500 miles (4,025 kilometers) from north to south and therefore has a number of varying climates. In southern Chile, the weather is generally rainy all year round. However, in the coastal areas of the South, the winters are rarely too cold and summers are comfortably cool. Austral Lodge is located in a temperate rainforest. Rain is probable, even during the summer months of January, February and March, but air temperatures are quite friendly, generally ranging from 10° to 20°C, though it can occasionally be warmer. In terms of river conditions, this means flows can rise and drop quickly — a favorable dynamic when pursuing kings on the fly! The first salmon enter the river in December and the Austral Lodge season runs from early January well into March. We are focused on fishing for fresh, bright king salmon, so we end our season well before the fish start to show their spawning colors. We will only be offering the prime weeks for four rods weekly. On every tide new, fresh salmon enter the river — in any given week of the season you will be fishing to a sizeable number of fish. What makes a great week is therefore not based on the number of fish in the river but instead on favorable weather and river conditions. Clear water and blue skies make for more challenging fishing than when rain or glacial melt add color to the water. Whatever the case, the river drops and clears quickly; days lost to high, dirty water are rare. All this is to say: Join us any week in our season that fits your calendar. Chances are you’ll find yourself with a great chance to hook a fish of a lifetime! A travel visa is not required for citizens of Canada, the United States or the European Union to visit Chile. Friday: Arrive in Santiago. Catch a connecting flight to Puerto Montt. Overnight at one of our recommended hotels downtown. Saturday: At 7 – 8 AM you will be picked up at your hotel and transported to Aerodrom Airport close tp Puerto Montt. From there you will board a private Aircraft to take you the remainder of the way (about 30 minutes flight) to Austral Lodge. Upon arrival at the lodge, you will settle in, have a delicious Chilean dinner, and fish the nearby home pool. 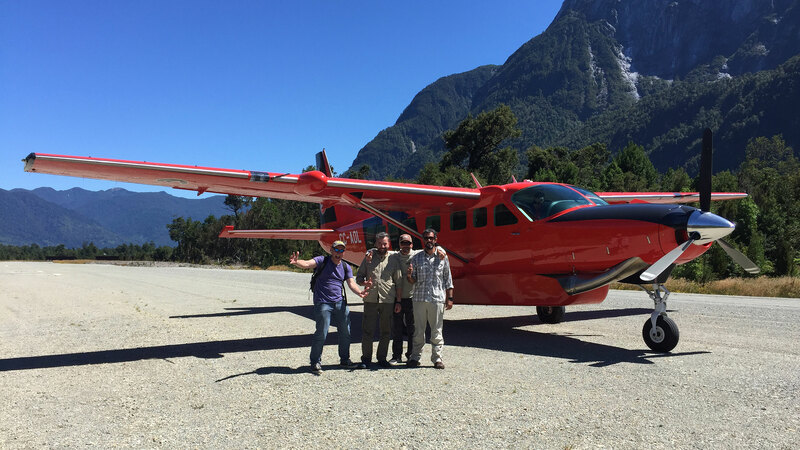 Notice: For season 2019 we have leased a private aircraft to transfer our guests between Puerto Montt and Austral River Lodge for our 2018 Valley of the Kings season in Chile. The aircraft, built in 2015 and with only 250 hours on the clock, is a very comfortable 8-seat C208 Caravan EX. Use of this aircraft will reduce transfer time to Austral River Lodge to approximately 1 hours total, instead of 6–8 hours by land and water. This means arrival at the lodge around noon, instead of later in the late afternoon or early evening. Sunday – Friday: Six full days of guided fishing. Included: Accommodations and meals, including beer and wine at the lodge, transfers between Puerto Montt and Puerto Varas and the lodge, and daily guided fishing. Not Included: International and domestic airfare, hotel and meals in Puerto Montt and Puerto Varas, gratuities. We at Salmon Junkies feel sure this incredible king salmon fishery will meet the highest expectation any spey fishing angler may have. Below the majestic and spectacular, glacier-capped Andean mountains you will find a pleasing variety of runs and pools enticing you to cast and swing your fly down and across. 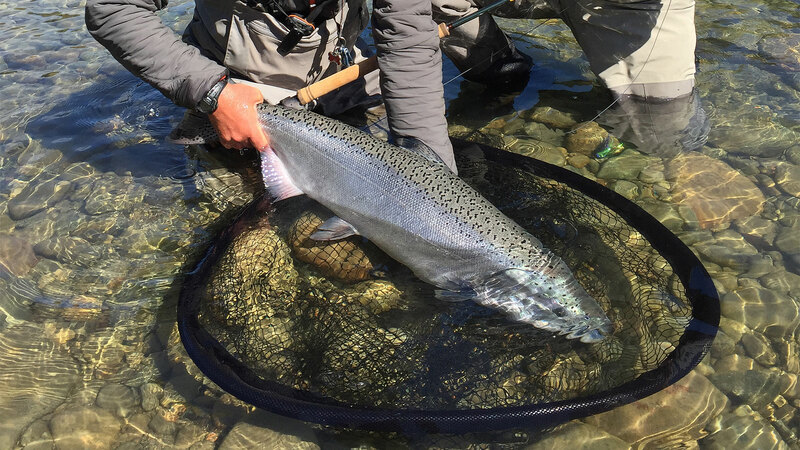 However, the mythical Austral fishery is a demanding chase for silver and suited for the experienced and committed salmon angler. We at Salmon Junkies are convinced that our Valley of the Kings Austral Chinook program will enchant your soul and forever remain in your heart. In close cooperation with Austral Lodge we will be your guardian angel. Our aim is to provide you with a remarkable and unforgettable fishing trip — perhaps the fishing trip of a lifetime.